...I really enjoy them and so instead of not having them out and on a tree I just filled the bowl up, every couple of days I'll replace them with others, I've got a couple more boxes of these lovelies so that will be no problem...the Santa Candy box was made by my Granny 50+ years ago, and I remember it being out every year filled with her homemade Christmas candies - like Turtles, Fudge and Chocolate Cherries...now it holds extra ornament hangers...the "Log Cabin" piece is from a quilter in Ocala Florida and it is something I have out every year. There you go sports fans, a little peek at Christmas around my house. Thanks for stopping by, do stop again!! So lovey. Thanks for sharing. So lovely, all of it. Merry Christmas to you and Rico and all the who-hounds. Everything looks wonderful. The things you have from your Granny are very special. 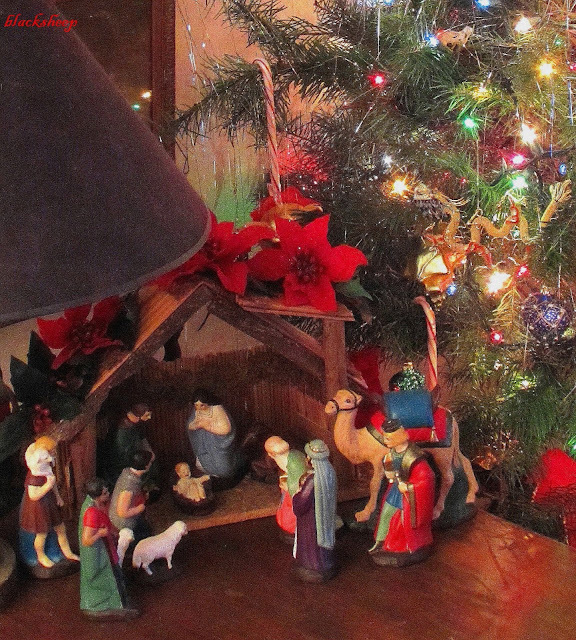 I have a manger(not the characters) that has been in my life as long as I can remember. As children my sister and I played with the Holy Family. That just might be why I don't have the original pieces. 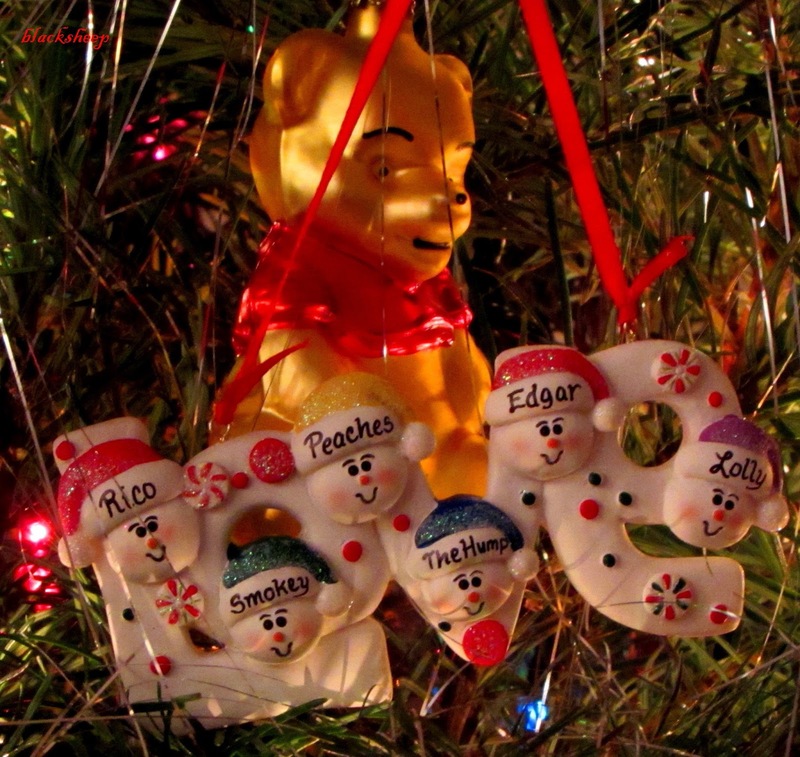 But it is filled with special character that my Step-Mom bought for me many years ago. Our tree is not a designer tree. It too, is filled with ornaments that bring wonderful memories as we decorate the tree. I hope you and Rico have a VERY MERRY CHRISTMAS! Due to my upcoming holiday travel I have not decorated for Christmas (fist time ever) so thank you for sharing. I love the Santa candy box and nativity. 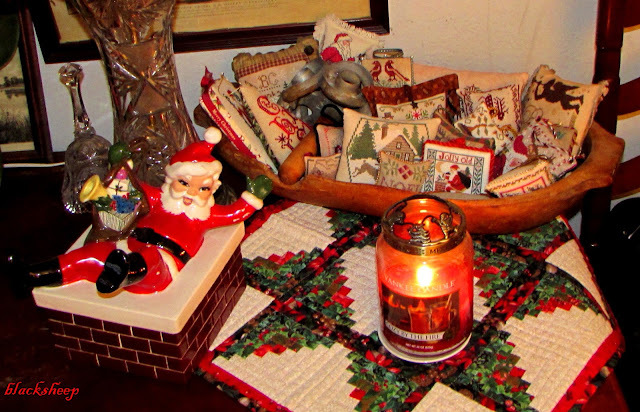 When I 1st saw the candy box I immediately thought of my grandmother…it reminded me of all of her holiday treasures. Your grandmother was a very talented woman. How lucky that you have these! Merry Christmas to you, Rico and all the furry kids! The nativity is precious and the ornament with the dogs is adorable. Looks like a merry little Christmas! So fun to see your festive Christmas décor, especially the Nativity and Santa from your Granny. Thanks for sharing. Merry Christmas to you and yours Edgar! Love your Christmas decorating. So much fun to see everything! I love your bowl of cross stitch ornaments. At present I am working on Santa's Night, stitched on Black Aida. My first venture on black and I am loving it. My husband and I are planning an over night trip to Oxford between Christmas and New Years. We want to visit that beautiful book store on the square. If you have any suggestions on eateries etc, I would love to hear them!! Lovely! So nice to have that little Santa to remind you of your grandmother.